This year’s Champions League will obviously go to Germany and it will be the seventh time a German club will be crowned the champions of Europe. Which makes one wonder, how many Champions League trophies have gone to the other top European football nations. 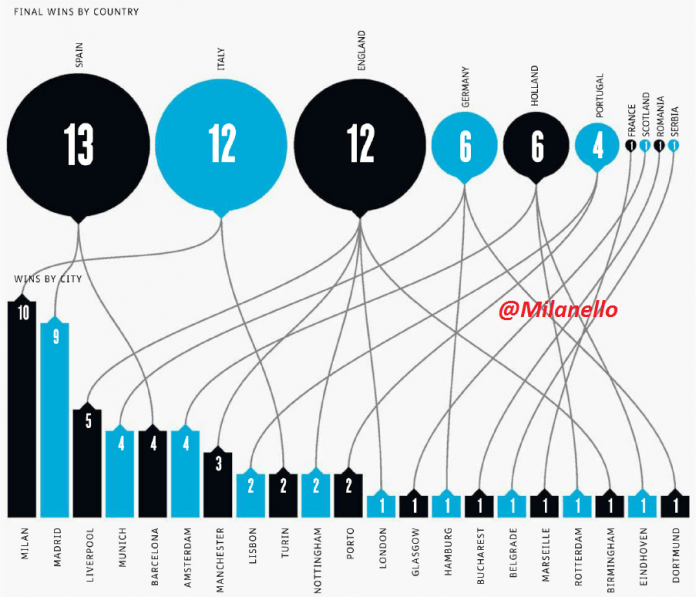 Lets take a look at how many Champions League or the European Cup trophies have been accumulated by each country. We know Real Madrid has nine and it is no surprise who won the other four. Madrid won their first one all the way back in 1956 and their ninth title came in 2002 when they defeated Bayer Leverkusen 2-1 in the final. The final was played in Scotland and the goalscorers were Lucio for Bayer and Raul and Zinedine Zidane for Madrid. Barcelona won their first in 1992 – the first trophy for Spain since 1966 and the last time this competition will be played under the name European Cup. Barca defeated Serie A side Sampdoria 1-0 after Ronald Koeman scored off a free-kick in extra time. Italy has produced some of the greatest footballers and their record in Europe justifies that statement. AC Milan are the most successful Italian club in Europe; they won the Champions League on seven occasions. Their latest success came in 2007 when Filippo Inzaghi’s brace saw them avenge their 2005 final defeat against Liverpool. Inter Milan and Juventus are the other two teams, winning three and two titles respectively. Internazionale’s latest win came under Jose Mourinho in 2010 while Juve have not seen European glory since 1996. England find themselves tied with Italy with 12 trophies but their trophies have been divided between more clubs than any other country. England’s first ever European success came in 1968 when Manchester United managed to score three goals in the extra time against Benfica after the game had ended 1-1 in regulation time. United went on to win two more trophies in 1999 and 2008. The most successful English club in Europe has been Liverpool. They have been crowned champions on five occasions, the latest coming in 2005 against Milan. Chelsea won their first trophy last year and that makes nine trophies for England. The Three Lions’ remaining three trophies were won by, what now seems unusual, Nottingham Forest and Aston Villa. Villa won their only trophy in 1982, just two years after Forest won and successfully defended theirs in 1979 and 1980. Germany will increase their tally to seven wins before this season is over. Bayern Munich lead the wins in Germany, with four, as they do in most other sectors of German football. Bayern’s last trophy came in 2001 but in recent years, they have come very close to adding to their tally. The remaining two trophies came to Germany in 1983 and 1997 when Juventus lost to German opposition on both occasions. The winners were Hamburg SV and Borussia Dortmund respectively. With the quality of Bundesliga on display this season, it is hard to believe that Netherlands are tied with them on European triumphs. But we must not forget, the Dutch have been way ahead of their time providing players that went on to win trophies for so many other clubs. Ajax have seen some of the greatest ever footballers in their ranks and their glorious history speaks for itself. They won the European title on four occasions. Their latest success came in 1995 when Patrick Kluivert’s solitary goal was enough to beat Milan. They were back to defend their title the very next year but lost to Juventus on penalties. The other famous academies from Netherlands are Feyenoord and PSV Eindhoven. Both have won the trophy only once in their history – Feyenoord in 1970 and PSV in 1988. We witnessed an FC Porto team led by Jose Mourinho leave teams like Marseille, Manchester United, Lyon and Deportivo La Coruna behind to reach the final and defeat an AS Monaco side who had left Real Madrid and Chelsea in shock. The final was pretty one-sided and Porto added to their earlier triumph in 1987. SL Benfica have won the other two European trophies for Portugal but their wins came all the way back in 1961 and 1962. The above account for 53 Champions League and European Cup trophies out of a total of 57 tournaments. The remaining four winners came from a different country each. The solitary trophy for France came in 1993 when Olympique Marseille defeated Milan 1-0 under the captaincy of Didier Deschamps. Celtic won the European Cup in 1967 to mark the solitary win for Scotland. Celtic are based in the city of Glasgow. Steaua Bucharest may seem like Europa League-material at best now but in the 1986 European Cup final, an all Romanian Bucharest side defeated Terry Venables’ Barcelona on penalties. In 1991, Serbia was still a part of the Socialist Federal Republic of Yugoslavia. Their club Red Star Belgrade made it into the final of the 1991 European Cup and defeated Marseille on penalties to win their first title. Serbia had won a European Cup even before it was formed. Sir Alex Ferguson retires - will it be Moyes or Mourinho?